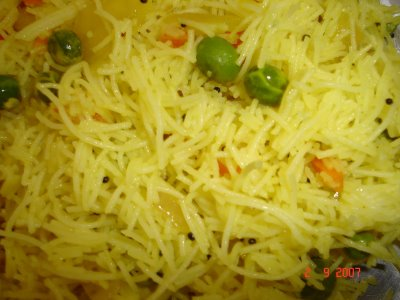 India wide famous sevai with some spicy taste!! Heat a pan with oil, add cumin-mustard seeds. let them splutter.then add onion. When onion turns to golden brown, add tomato.cook it for a while. Now add peas, mix it. add turmeric,salt , garam masala & chilly powder. Pour a glass of water & let it boil. Once it boil add sevai in it. Then add lemon juice, sugar & mix it & remove from fire. Before serving garnish it with coriender & then serve hot with lemon pickle. Its nice .But i also add peas and carrot(diced in small pieces).they increase taste and look.